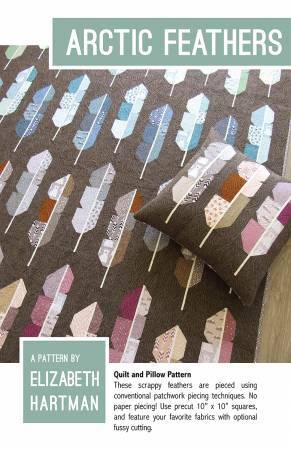 Arctic Feathers includes instructions for making 34in x 44in, 58in x 62in, and 70in x 80in quilt projects, as well as a 20 x 20in quilted pillow cover featuring fun patchwork feathers. All projects are made with conventional patchwork techniques. No templates or paper piecing. This pattern is compatible with precut 10in squares and scraps. Pattern includes optional fussy cutting guides.